World number one Rory McIlroy bowed out of the World Golf Final in Turkey after losing his third successive match. 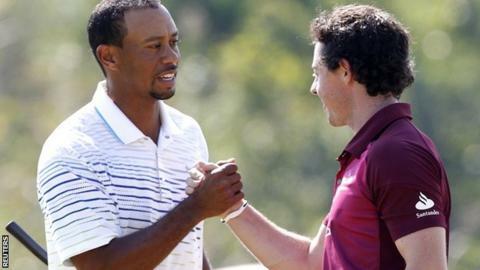 Having lost to Matt Kuchar and Charl Schwartzel, McIlroy needed to beat Tiger Woods with a low total in the final group game of medal match play. But he could only post a one-under 70 as Woods surged into the semi-finals with a fine 64 containing no bogeys. Woods plays Justin Rose, who carded a 62, in the semis, while Lee Westwood shot 64 and faces Charl Schwartzel. McIlroy, who won his second major in August by claiming the USPGA title at Kiawah Island and helped Europe to Ryder Cup glory last month, was behind from the opening hole against Woods, after sending his opening drive into the water. With a three-wood he drove pin high at the 304-yard par-four fifth but miscued his chip and could only make par. Woods tapped in from four feet for his second birdie and opened a three-shot lead as McIlroy remained the only player in the eight-man field over par. At the next, a par three, McIlroy missed the green and made another bogey, while Woods rolled in a six-foot birdie putt to go five shots clear. McIlroy birdied two of the last three holes but Woods matched that and maintained his run of improving by three shots in each of his three matches. "I really hit it good out there," the 36-year-old world number two told reporters. "I missed a couple of putts so it could have been a really low number. "My game is starting to turn around a bit and I am beginning to hit it like I did at the start of the year." McIlroy, accompanied this week by girlfriend and tennis player Caroline Wozniacki, will receive a cheque for $300,000 for finishing joint last, and said: "I'm not that disappointed because I've got the afternoon off around the pool. I came here because I have never played in Turkey and there are a lot of good players here. "I thought it would be a fun week and it has been. I've now got four events left this year starting the week after next, defending my BMW Masters title in Shanghai." Meanwhile Westwood, one of three players resplendent in shorts at the Antalya Golf Club, was in fine form with the putter as he played the first nine holes in seven under, the highlight an eagle at the fifth when he drove to within 10 feet at the 373-yard par-four. He dropped his only shot of the round at the 11th but finished a comfortable five shots ahead of American Hunter Mahan, who ended without a point despite rounds of 67 and 69 this week. Rose was level with US Open champion Webb Simpson at seven under after 15 holes, before a two-shot swing at the par-five 16th, and a closing birdie gave the Englishman a nine-under total, the best of the week. Schwartzel recorded four birdies on each nine in an impressive 63 to defeat Matt Kuchar by two strokes.